The tub in these images is a soap dish from Target. 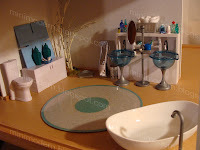 If you read this boring blog, you already know that I often use soap dishes for bathtubs and platform beds. 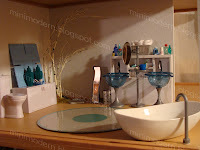 It seems the best variety of soap dishes are found at Bed Bath & Beyond and the cheapest (but still quality) can be found at places like Marshall's or TJ Maxx strewn about the place with red clearance tags. The soap dish here reminds me of some of the high-end designer tubs on the market today. 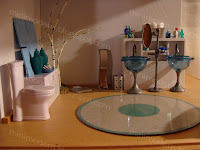 The sinks and mirrors are from the discontinued Lil Bratz Fashion Mall sets. Below are some pictures of the scene with figures. Hi.Your blog is amazing! 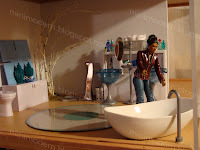 You are so creative.I LOVE modern style dollhouses and miniature rooms.These are so much fun to see! Thankyou so much. Soap dish as bathtub is a really good idea. Barbie needs a tub to go with her dollar store bathroom fixtures. I want to live in your houses! As always, I love your mad designing skills. Thank you all for the very kind comments. I am jealous of all the great stuff you find to make modern dollhouses. I want to design one so bad but need a pre-built. 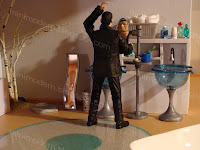 Where did you find the figures and LOL at the Mr. Suave taking a leak. The figures are all Dr. Who , Primeval (and soon to be) Torchwood figures made by Character Options. "You rock my big rodeo world" as the song lyrics go. Each weekend, visiting your site is a MUST for me. Thanks to a previous post of yours, I now am hooked on AG mini room furniture for my future dollhouse. I have been able to aquire some terrific pieces on Ebay.